Who I am or how I feel. From the tears I might have cried. Those I love so very much. Walls that need to fall! Jan 2008 - Solo: My first autonomous robot - a line follower. It used an ATMEL AVR series, ATMega 16 microcontroller, L293D, IR sensors, DC Motors and a 9V battery. Shalina is a Sanskrit word meaning modest and the robot was a named so because it was a modest starting bot in the advanced world of autonomous robots. 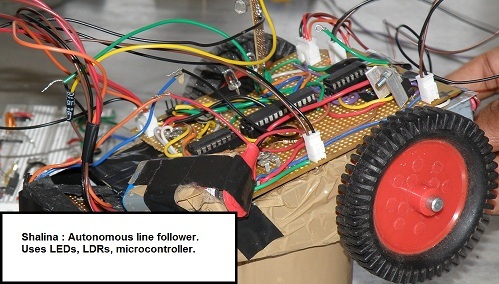 Feb 2008 - Team of 4 : A semi-autonomous robot built for a robotics competition, stood second. Interfaced with PC via the parallel port. Robot control program written in C++. Problem statement was to build a PC keyboard controlled, PC interfaced robot. Winners were decided based on fastest manouvre of a track like those used in line-following competitions. I don't remember precisely why it was named Zorro - probably a lady team member's fascination with Zorro or Antonio Banderas or both! May 2008 - Solo : Used the same hardware design as Shalina. This was serial interfaced to the PC. A MATLAB program primarily making use of the Canny edge detector and Hough Transform was used for edge detection and line following, instead of the original IR sensors. Made use of a USB Webcam for image acquisition. DivyChakshu (pronounced div-yah-chak-shu) means the 'Divine Eye' in Sanskrit. Feb 2009 - Team of 3 : Built during a 16 hour workshop on legged robots as part of Unnayan 2009. Arthrobot was a quadruped, built using ATMega 32 microcontroller, 3 servo motors and associated electronics. Was a 3 day workshop where participants 1) learnt basics of miniature RC controlled flying machines. 2) Designed and built their own wings and body parts for the craft. 3) Assembled the RF modules, IC engine onto the body. 4) Field tested their aerobots! In college I got many ideas - some of them didn't materialize. A list of my goof-ups! On completion, the system would be able to use line crawling robots using Swarm intelligence, to detect defects in high tension electrical wires. This project was fated! We did literature surveys for around 3 months but the project group lost interest as we could not procure funding for buying the required modules and processing units. I had envisioned a system based on CMUCam but it was kind of expensive by Indian standards and we low on cash! Thanks to the literature survey have a decent idea about swarm robots. Project attempted to use a computational modeling technique and SVM for classification implemented on a Texas Instrument DSP kit. Started out strong! Spent almost 2 months on this....Used a camera module by Bitec Ltd. to grab video frames into the DSP. Found the resolution was too poor for facial expression recognition tasks. Got familiar with TI CCStudio. Moreover, it was a DSP kit with limited memory and processing speed and a very steep learning curve! Part of the BIT Mesra team that attempted build a racing car for the Formula Student competition. I was responsible for the embedded systems and electronics on the car. Was pretty excited. Read up articles on formula car embedded systems, helped with publicity, website and sponsorships....our budget 25 lac INR (around $55000) and then....the worldwide economic slump of 2008-2009. Crashed our project! We could not find any sponsor that year to fund us, although our college had already performed extremely well at Forumula Student, Silver Stone, UK in the year 2007 (with our seniors in that team). Having been interested in web development and cryptography in my high school days, I had this urge to create a software to write HTML which could also be used to encrypt images and webpages. With this idea in mind I set about to build a software. It was selected as one of the 8 innovations in the Computer Science category to be presented at Intel Science Talent Discovery Fair, (STDF), Hyderabad, December 2003. Out of around 700 ideas from all over India given by school students from 8th upto 11th grade in various fields of science and engineering, 70 odd projects were selected for the national fair at Hyderabad. The winners of the fair get an opporunity to represent India at International Intel Science and Engineering Fair (ISEF), held in US. Electronics had been a childhood fascination. Electronics toys made in China had stormed the Indian market when I was in middle school. Intrigued by how those tiny RC cars and battery powered toys worked, I used often open them up and study the components inside. In my 11th grade, I thought it would be cool if I could control such toys with my voice. Combining my knowledge of VB and electronics I built a toy excavator that could be controlled (moved in the spatial coordinates and also move its buckets up and down. Made use of Microsoft Speech API for the voice recognition. Interfaced the robot using the parallel port of the computer. An H-Bridge was made using DC relays. Apart from that basic electronic circuitry with diodes and transistors was used. Working late into the nights was a habit I developed in the later years of high school. In those days, internet was expensive and I didn't want my computer to download data while I was away. Pretty often though, in the morning rush I forgot to shut down my computer. My mom had to do it, but there was a small problem! She used to get confused with all the English words used by the OS. Thus to help her and other computer users in Hindi and also contribute in my own small way to software development in Hindi, I developed this Shutdown Timer. A simple VB application it makes use of the Windows API. Source Code available on request. All good things come to an end! So did my school life. Suddenly faced with the prospect of no longer being together with my friends, some of whom had been classmates for 13 long years, I thought the web could be leveraged to help us stay in touch. Orkut or FB were virtualy non-existent or not as popular in our circles. So I developed a school reunion site based on the popular Joomla CMS. However, it was customized to suit our requirements and so a large number of modules were re-coded or modified. Learnt about website management, server side scripting and web servers and hosting in general during the course of this work. Added a lot of features as and when new requirements or suggestions came up. To this day I am comfortable with Web Development with JS, PHP and XML because of ApnaLFS. Technologies Used : PHP, JS, XML, HTTP API for a proprietrary Bulk SMS service. Details : Visit apnalfs.com to see the website. Was a website developed from scratch using PHP, XML and JS for a Hindi poet in my city. Was a learning experience because all the content was in Hindi and thus issues regarding proper storing, acquisition and rendering of the fonts had to be taken care of. The header image is a picture of a section of the existing Berlin Wall. It is a scaled down version of a photograph clicked using my Olympus 565UZ camera during my visit to Berlin in June '09 during my internship stay in Germany.